Centrally located but in a relatively quiet zone, good access to public transport facilities, many mini-markets, supermarkets and other service providers within comfortable walking distance and very nice and cozy apartment setup tiled with parquet rather than with fitted carpet (great for anyone suffering from dust-related allergies). Also very clean and with a very accommodating host. Fully equipped kitchen, homely environment, location is fantastic. Studio with all needed necessities. 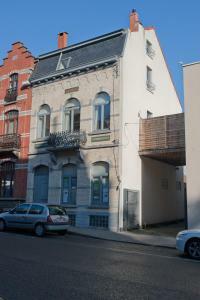 Location is in quiet area of Brussels and city center easily reachable in 20 minutes using public transportation. The owner was hospitable and available when needed. 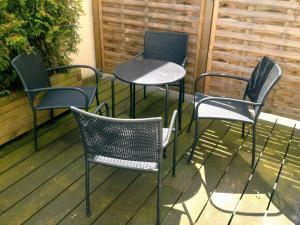 Clean, comfortable flat, well situated (for us - some might find it a little far from the nearest underground station). Very friendly owner. comfy bed, nice atmosphere, the beautiful park you can reach by an old railway converted to cycling and pedestrian path, just next to the property door. it's worth taking a walk! There are also many shops and supermarkets around, and you can do some yoga at the club next door. Easy walk from Metro or Tram. Grocery stores and selection of restaurants nearby. Mini oven and 2 ring hotplate. Good central heating. No breakfast, this is an appartment, you need to bring your own. The apartment is very nice and cozy, close to two metro stations and other public transport options (tram, bus). The host was extremely nice and allowed us to do an earlier check-in, which we appreciated a lot since we arrived with a very early flight. We had the duplex which had two double beds and two separate bathrooms. The beds were very comfortable and the neighborhood noise level was quite OK. The kitchen was well stocked and the wifi worked really well. We really felt at home there and would recommend the apartment for anyone looking for an intimate setting, away from the noisy center. Lock in a great price for Appartements Mantra – rated 8.6 by recent guests! One of our best sellers in Brussels! These apartments are located along Auderghem’s shopping street. Guests can relax in the spacious living room of the 2 bedrooms apartment, which has a flat-screen TV.In this apartment and also in the one bedroom apartment, the kitchen comes with a coffee maker and a dishwasher. There is a separate dining area. Several restaurants are also within walking distance of Mantra Apartments. Oudergem / Auderghem is a great choice for travelers interested in sightseeing, food and ambiance. When would you like to stay at Appartements Mantra? This modern apartment is a penthouse of 65 square yards. There is a spacious living room with a sofa, flat-screen TV, and DVD player. It includes a separate bedroom and a second sleeping area which is located on the mezzanine. There is a well-equipped kitchen with a dishwasher and a coffee maker. Linen, towels and cleaning products are provided. Private parking is available upon request. Located on the ground floor, this apartment consists of a room, a kitchenette with a dining corner, a shower and a separate toilet. There is also a living area with a flat-screen TV and a DVD player. This modern and bright apartment features a bedroom, a living room with cable TV, a shower and a toilet. 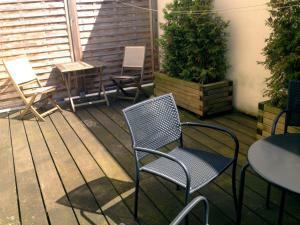 It also includes a large private terrace of 20 square yards. The well-equipped kitchenette includes a dishwasher. This room can accommodate up to 2 extra guests on the sofa bed. J'ai acheté ma maison en 2000 et ai tout modifié pour vous accueillir dans 3 appartements ou studio. J'ai crée une salle polyvalente et différentes activités sont organisées, telle que conférences, cours de yoga, formations... Je vis à la même adresse. J'ai voyagé de part le monde près de 25 ans. Je vis actuellement avec mon fils de 9 ans à Bruxelles et en tant que spécialiste de l'Indonésie (Bali plus exactement) j'y retourne chaque année et y organise des voyages découvertes. Je parle indonésien et ai vécu 6 ans à Bali. Je suis dans un quartier de Bruxelles qui a la chance d'avoir beaucoup de superbes parcs, avec des lacs. C'est le paradis des personnes qui aime le jogging, la nature... En été vous avez un mini golf, des pédalos et des barques sur les lacs. Je suis pas loin du musé du tram, du parc du 50naire avec différents musées. Je suis à 3' à pied du centre culturel d'Auderghem. Area Info – This neighborhood is a great choice for travelers interested in sightseeing, food and ambiance – Check location Great location - show map Guests loved walking around the neighborhood! House Rules Appartements Mantra takes special requests – add in the next step! Appartements Mantra accepts these cards and reserves the right to temporarily hold an amount prior to arrival. Parking is available but needs to be confirmed by the hotel. Extra charges may apply. For any reservation more than 7 days the first night needs to be fully paid as a confirmation and can not be refunded. Please inform Appartements Mantra of your expected arrival time in advance. You can use the Special Requests box when booking, or contact the property directly using the contact details in your confirmation. quiet surroundings, well looked after at arrival. When sb is above, upstairs, the floor creaks a little bit so there is a small problem with acustics. For me it was not a problem but I can imagine that for others this could be a slight inconvenience. A little bit cold, given the temperature outside and the fact that heating system had not been started in the building. With heating on, no problem. As I knew the neighbourhood, it was a perfect choice for me, as single traveller. Small detail: no cups when we arrived and some rather old food and coffee left over from previous occupants. The only drawback of this apartment is that it doesn't come with air conditioning or a ceiling fan (not needed for most of the year in Bruxelles) but can be a drawback in summertime. I did not, however, enquire about getting one provided, so it is possible that the landlady might provide one if asked to. Nothing in particular. The location is not fantastic, but good enough.